As the Christmas season approaches, for most of us it is one of the most exciting times of year – the time when we get to see long lost loved ones, eat and drink more than we would like to admit to and make the people we love smile, with specially chosen gifts. It’s one party after another, crammed between endless meals and buffets and get-togethers – however, for those of us who find ourselves alone at Christmas, it can be one of the hardest times of year. In the UK it is often highlighted that many older people experience loneliness all year round, particularly around Christmas, however recent studies have suggested that young people – notably those in their early 20’s – are much more likely to experience the negative effects of being alone, especially in big cities. A recent study in the UK found that one in five of us spend Christmas alone or with just one other person, whilst throughout the year – particularly those in big cities such as London, Birmingham or Liverpool – over 9 million people across the country consider themselves to be always lonely. 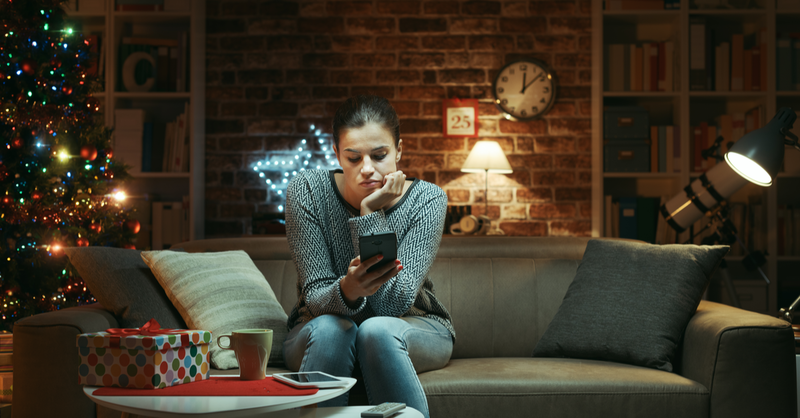 When every other advert depicts giant family gatherings, huge Christmas dos’ and glamourous parties with hundreds of people, it can be particularly difficult to ignore loneliness around Christmas time. And even when we do have invites from new friends or work colleagues, spending such an important time with people who are surrounded by the people they know and love, can mean you experience even stronger emotions of loneliness than if you were to have stayed at home. Christmas and religious celebrations aside, the winter – when the days are short and the nights long and cold – can make us feel a lot lonelier than other times of year. Social media, films and television – even our favourite books show couples cuddled up on the sofa in front of the fire, embraced with mulled wine at bonfire displays and sharing cozy drinks in the corner of the pub. – However, the reality of spending the winter alone can be somewhat different. Research suggests that being lonely can be as harmful to our health as smoking 15 cigarettes per day, increase your risk of death by around 30%, be more harmful than obesity and make you more likely to suffer with dementia, heart disease and depression – however, it is something most people brush off or don’t consider important. In the run up until Christmas a number of different charities, particularly homeless shelters and support groups, request the help of volunteers to provide soup kitchens, supplies for the cold weather and often Christmas dinner for the homeless and vulnerable population. Spending the day with those less fortunate can often bring a meaning back to your Christmas and being surrounded by people who might otherwise be spending the day alone, can help combat a little of your own loneliness and bring you closer together with those you share something in common with. Loneliness – especially amongst the older generations – is a huge problem in the UK. However, there are a number of charities and support groups that try to combat this around the Christmas months. There are a number of local and international charities where you can find other people – often older people who live alone all year round – who would otherwise be spending Christmas alone and spend the day with them in their homes or at local support centres, churches or libraries. Single parents, students new to the area and those who have relocated for jobs often find it the hardest to not feel lonely in a new town or city. If you have moved recently visit your local GP or library to find out more about local activities or get togethers for people your age – joining a book club, the gym or even mum and toddler class can make all the difference to helping you find friends with common interests, and help combat the feelings of loneliness when sometimes it feels like your only company is the television. If you’re feeling lonely this Christmas, don’t wait to seek help to combat your emotions – those of you who suffer with your mental health can find being alone at this time of year worsens a number of symptoms that can be difficult to overcome if ignored. Unlike through the NHS, private therapy has no long waiting lists or unrealistic commutes to and from appointments – therapy can be accessed immediately at a time that suits you. My Online Therapy offer a unique, interactive platform that is the UK’s first professional online therapy service. Sessions can be accessed from your desktop, laptop or handheld device – from a location that suits you, whether it be your office, your sofa or even whilst you drive home from work in the evening. Learn more about our online services, the issues we can help with and sign up for our new online platform at our website. Get started on your path to better with our online psychological therapy service. Our online questionnaire assessment matches you to the right psychologist and therapeutic approach.